All of us at ukholeinone.com would like to extend our hearty congratulations to Mr Sewell who managed to score a hole in one at a recent UK Hole In One insured event. 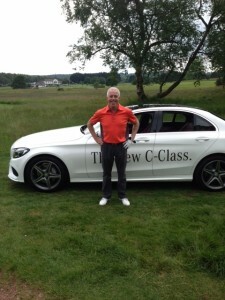 Mr Sewell has won a Mercedes-Benz C220 Blue Technology AMG Line Saloon for twelve months’ – not a bad return for a single golf shot! Mr Sewell is a keen golfer who plays off a handicap of 8 and struck his hole in one on a 189 yard hole using a 6 iron Bridgestone while participating in the Heathland Classic at Hollinwell Golf Club. Remarkably no mulligans were taken, making Mr Sewell’s hole in one success all the more impressive. If you would like any help or advice regarding hole in one competitions or would like to discuss a policy then please call us on 0345 370 2844, contact us by clicking here or for a policy quotation please click here.